Trade In Your Burro For a '67 Fury! We can probably thank the Spaghetti Western craze of the mid-1960s for this bewildering Fury ad. 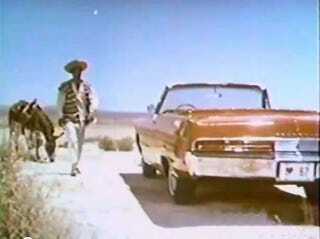 This vaquero is out riding his burro in what appears to be eastern Riverside County when he discovers a brand-new '67 Fury convertible with the keys in the ignition! Don't worry about the abandoned burro when he takes the car; there's a happy ending.